Happy New Year! I think a fantastic way to start out a new year is to review the eight limbs! 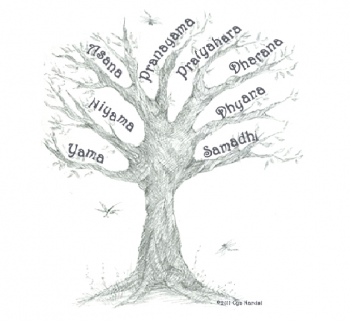 One of the most important things to know about yoga is that there are eight limbs or paths of yoga. They serve as a guideline for living a purposeful life. Here’s a very brief overview of each one. 1. Yama – Our behavior and attitudes towards others and the world. Living our lives in a way that includes doing no harm, being truthful, happy with what we have, exercising moderation in all things and celebrating the happiness of others. 2. Niyama – Our behavior and attitudes towards ourselves. Self-discipline through cleanliness, contentment, daily spiritual practices, self-study and continued connection to our own divinity. 3. Asana– Physical poses. This is what you’ll encounter most often in a public yoga class held at a studio or gym. All physical styles of yoga fall under the umbrella of “Hatha Yoga.” Examples include Vinyasa Flow, Iyengar, Ashtanga, Anusara, Jivamukti, Restorative, etc. 4. Pranayama – Breathing exercises. Helpful for making our breathing a centerpiece in our lives to create calm and balance whenever needed. Some breath practices may be applied to asana practice so our breathing is more efficient in challenging poses. 5. Pratyahara – Control of the senses. This limb begins the work of turning inward. Drawing our awareness away from the external and objectively observing ourselves and our habits. 6. Dharana – Concentration. Each stage prepares us for the next. Now we focus our attention on a single point, slowing down our thinking process in preparation for the next limb, Dhyana. 7. Dhyana – Meditation or Contemplation. An uninterrupted flow of Dharana. There are so many different styles of meditation; each involves aspects of a focused mind. 8. Samadhi – Enlightenment! Yippee!! But what does that mean? Disciplined practice of the previous seven limbs may produce periods of feeling whole and complete. I call them “mini-samadhi moments.” A moment where we transcend our physical bodies and live in a state of interconnectedness with all things. Yoga means “union,” and we are striving for an authentic sense of oneness. There is no “you and me,” only “us.” This is what we work towards- an absorbption of the knowledge of yoga. To learn more about the Eight Limbs, consider taking our Yoga Teacher Training! Our philosophy lessons focus on these principles and much more!